Here’s are some excellent skin cancer prevention resources for your health classes. cancer. Sun Smart U. includes video accounts of young adults dealing with melanoma and providing suggestions for children. The program is designed to encourage behaviors in sunny conditions, such as using sun-protective clothing and sun screen lotion in a way that makes these measures easy to apply. The curriculum also stresses the significance of very early detection of skin cancer with information about the warning signs. There are three instructional formats that teachers can use, including SMART or Promethean interactive whiteboard, or Microsoft PowerPoint. Using both classroom instruction and activities, these lessons are a fun and easy way to teach students lifelong sun safety habits. 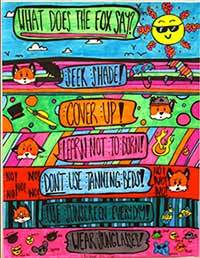 Also provided are the student-produced videos and posters that resulted from the “I Am Sun Smart” contest. This entry was posted in health by Richard Moss. Bookmark the permalink.